Treat yourself to some time in Cancun. The sea has a beautiful turquoise hue and it’s hard to think it’s the same Atlantic Ocean as the water you see in the Carolinas or anywhere northward. The geography mavens will say it’s the Caribbean but its still Atlantic water. With the economy of modern society falling quickly into an unending stream of bankruptcies and company lay-offs it seemed like a good time to cash in the Marriott points and United Points before both companies go the way of the dodo. So the search for sausages went south of the border. Here’s what we found after extensive research, well somewhat extensive. 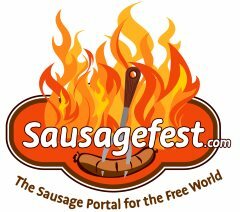 We couldn’t locate a single freestanding sausage shop in the immediate Cancun area. I even asked Manual who was our bar guy at the Casa Magna swim up bar. He’s been with Marriot for 15 years, lives near the airport and knows the local scene. Maybe it was the Zombie – he was slipping between tourist region pidgin English and Midwest news anchor English. So I ordered uno mas and decided there was no upside to interrogate the alcohol vendor. Kate swam away, I fell into thought and Manual turned back to his blender. This research was hard work but I wasn’t minding the zombie haze. I suspect there’s a decent sausage maker in the area but nothing popped up on our radar this trip. About 90 minutes south of the Cancun ‘region tourista’ is a 250-acre tropical park called Xel-Ha (say shell-ha). Amusement parks, anything Disney, and family parks are low on my priority list. Between passing a stone and going to Great America neither offer any moment of joy. My arm was twisted by Kate and Kristen (the translation team) and I found myself actually enjoying this tropical park. First, you have to highly respect any park that has an open bar ready for you from breakfast time to when you leave. We got there about 9:30. The bus ride put me to sleep and as we headed to the breakfast area I was thinking of an eye opener. Xel-Ha puts on a great spread and it’s been long time since I had breakfast with 500 people all wearing swimwear. I like the idea of breakfasting in my swim trunks. There was no shirt or tie to catch food scraps. And, you could peruse the swim suit models with a tequila laced Bloody Mary (when in roman, etc.). There was enough talent around to give Kate and Kristen some competition. Aside from the beautiful tropical setting, you also don’t want to miss breakfast at Xel-Ha because they have ‘chorizo y patat’ (potato) on the buffet table. This is rib sticking stuff and has all the flavor and carbs you need to get the day off to a better than average start. You get a second pleasurable sausage option by helping yourself to the salchicha (sausage). The breakfast sausage back home isn’t like this. It was excellent by itself but better with the huevos and the Tequila Mary. I was surprised at how lean and flavorful it was, but then again I was using my back home yardstick of breakfast sausages. In the US we’re migrating our way out of bland breakfast offerings. I’ve cruised through hundreds of breakfast buffets where the sausage offerings are grayish, fatty and far from a recognizable meat form. If you go to Xel-Ha, you’ll see that the sausage taste like meat. It sounds simple but they got it right. You would be a very rich gringo if you made a dime for every time you had an American breakfast sausage that was a little grey container of fatty fluids. So to recap: tropical park of beautiful scenery, open bar, plenty of snorkeling good times, floating in an inner tube for the real lazy and good sausage. I should also mention that the rest of the food offerings were better than average and the wait staff was super friendly and attentive. Slight correction – maybe its more than 90 minutes to get there. Traffic is subject to the same crap we get in the states with construction, accidents, etc. I will say that I don’t understand why the highways I travelled on in Mexico had speed bumps every ten miles or so. You get rid of those hideous things and your cruising speed will go up. When you feel like getting dressed again, get over to Limoncello. It’s in the hotel zone of Cancun a little south of Senor Frog’s and a little north of Plaza Flamingo. Once the sun goes down, you’ll be dining waterside at a spot with a nice sunset view. The sausage offerings you’ll want to consider are these: Gnocco fritto con salumi: This is a dish of deep fried gnocchi puffs served with Italian cured meats (Prosciutto, coppa and salami). Deep-fried pasta usually isn’t a hit with me but I threw out concern about my cholesterol level once I was south of the border. I thought my entrée was the winning one at the table. Definitely try the pappardelle with Italian sausage. The red sauce was light; the sausage was lean and flavorful. The waiter was newly from Hungary and he thought this was one f the chef’s best dishes. The translation team sampled my plate enough to chisel my portion down to appetizer level. So we had a unanimous opinion for one of the few times during the week. The nighttime ambience was beautiful, the entrees very good, and the service staff attentive. I wish that their wine list were more moderate in price. I had a glass of white to start and a glass of red with the entrée. It was everyday stuff. If I wanted to drop more dough on a bottle they had decent selection of South American and Spanish reds. I’d recommend you slosh down a wine of your choice before you get there then settle in for whatever wine you like when you get there, if you’re watching pesos. 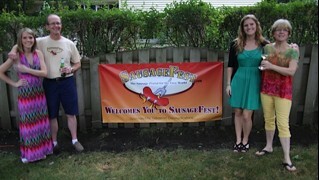 Although Sausagefest is about all things sausage we also enjoy a fine sausage-less meal where we find them. La Habichuela is a white tablecloth restaurant in the old city of Cancun. We took a bus from the hotel (a great way to get around Cancun and cheap) walked a few blocks and found this four star place. This is a well-run first class place. Our party of four was smiling and nodding from start to finish. The wine list had a good selection of South American offerings. The Argentinean chardonnay was crisp and un-oaked. All the entrees were very good and my grouper was the best I’ve had in a long time. Armando Pezzotti is the owner and you’re in the hands of serious host when even the breadbasket offerings are exceptional. I say try them all with the garlic butter spread they bring with the rolls. I’d say after 30 years in the business he’s got the formula down. Sure, the chips and salsa are first rate too, but try all the breads as well. I didn’t spot any sausage-based meals on this menu’s edition but let me know if you spot when you visit. In case you were wondering, La Habichuela translates into “bean”.